By Dr Nguyen Hung Son, deputy director-general of the Institute for South China Sea/East Sea Studies, at the Diplomatic Academy of Vietnam. China's actions were completely contrary to the diplomatic steps it had taken since last year to improve Asean-China relations and bring back confidence in the region, by charming its neighbours with promises of restraint and win-win cooperation. Chinese Foreign Minister Wang Yi's decision to visit Asean in his first overseas trip as foreign minister in May last year raised hopes in Asean that China was giving first priority to peripheral diplomacy. It also suggested that China viewed Asean as a valuable strategic partner. Asean wholeheartedly welcomed the visits of China's President Xi Jinping and Premier Li to South-east Asia in October last year. Asean was truly enthusiastic and hopeful about Beijing's proposals on the future of the region. Asean states also welcomed President Xi's historic remarks to the Indonesian Parliament when he stated that Asean and China should build "trust and develop good neighbourliness" and "stick together through thick and thin". Asean was further encouraged by Premier Li's proposal on the 10th anniversary of the Asean-China Strategic Partnership to turn Asean-China relations from a "golden decade" to a "diamond decade" with a Treaty of Good Neighbourliness, Friendship and Cooperation, including the adoption of "common and cooperative security". China indicated that its Maritime Silk Road for the 21st Century initiative was inspired by Admiral Zheng He's peaceful voyages to South-east Asia in the 15th century. These voyages were not about gaining new territories, but about commerce and expanding Chinese civilisation. As a result of these diplomatic statements by Chinese leaders, Asean was hopeful that China was changing its approach to its maritime disputes with its neighbours. Asean leaders were closer to becoming convinced that "China's dream" could also be made "South-east Asia's dream". Asean responded in kind to China's goodwill, seizing every opportunity to build confidence and cement a good relationship with the new leadership in China. It promptly "noted and appreciated" China's proposal for a new Friendship Treaty, and supported the Asean-China Maritime Cooperation Partnership. Asean also agreed to fully and effectively implement the Asean-China Declaration on the Conduct of Parties in the South China Sea (DOC). Furthermore, it actively proposed confidence-building measures. Asean and China then began consultations on the much-awaited binding Code of Conduct in the South China Sea. Indeed, progress was being made during the consultations. Thus, for the first time in years, the overall situation in the South China Sea was calmer, with both sides exercising restraint. There were certainly fewer incidents. All this took place despite the fact that China issued new Hainan fishing regulations and Chinese officials made statements about the prospect of China introducing an air defence identification zone in the South China Sea. It was, therefore, a complete shock to Asean and the international community when China sent its biggest oil rig into its neighbour's backyard, claiming the maritime area as its own. China attempted to intimidate Vietnam with a large fleet of both military and paramilitary vessels. At the same time, it dismissed calls to resolve the dispute through dialogue and other peaceful means. 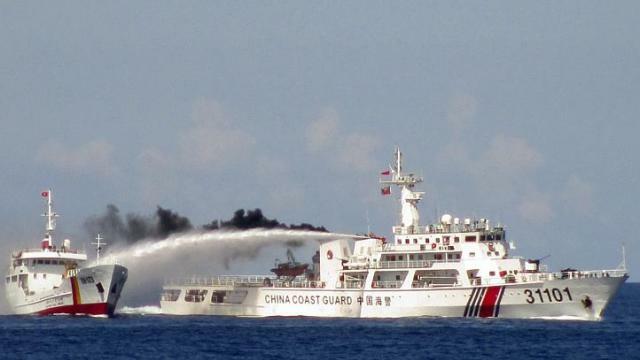 The dangerous escalation involved the use of vessels from various agencies and provinces in China. This suggests that the actions were deliberate, well-planned and coordinated from Beijing. Such activities threaten regional peace and stability. They are inconsistent with international law and disregard Beijing's pledge to fully and effectively implement the DOC. Furthermore, they are totally contrary to friendly gestures made to Asean by Chinese leaders since last year. China's latest highly provocative actions prove that China is no longer a status quo power, and is actively seeking to re-establish a China-dominated regional order in South-east Asia. image by acting completely contrary to the pledges of its own leadership? Is it in China's interests to stir up regional tensions and sacrifice the peaceful and cooperative environment that was being developed last year? The leadership in Beijing often says that a peaceful and cooperative environment in the region is a prerequisite for China's development because it will allow China to focus on domestic issues, in particular on economic restructuring and reform, and to seize the "strategic opportunity" to catch up economically with the United States and the West. If China thinks the US is using the South China Sea to drive a wedge between Asean and China, Beijing can prevent this easily by simply agreeing to adopt a code of conduct with Asean. China's assertiveness in the South China Sea, on the other hand, only encourages US intervention. Asean has been serious about building good neighbourliness, friendship and cooperative relationships with China. If China loses Asean's trust and friendship, it will be the first country in history to seek great power status with no true friends among its neighbours.